The president and his allies fanned out Monday to blame Democrats for a Trump administration policy that separates undocumented children from their parents. WASHINGTON — President Donald Trump and top members of his administration pushed back Monday against a cavalcade of criticism from Republicans, including some prominent White House allies, of a border policy that has led to the detention of immigrant parents and their children at separate facilities. The White House narrative — articulated in different settings by Trump, Homeland Security Secretary Kirstjen Nielsen, Attorney General Jeff Sessions and others — was that Democrats were at fault for a pre-existing framework of laws and policies, including an Obama-era detention waiver for families, that the administration says has encouraged immigrants to fraudulently claim familial relations. 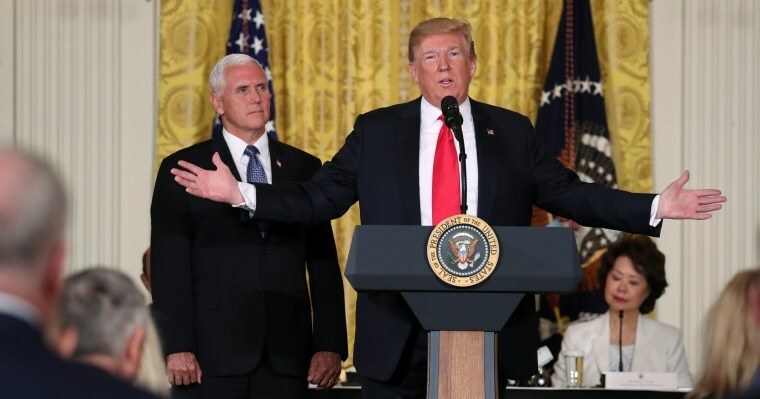 "The United States will not be a migrant camp and it will not be a refugee holding facility ... not on my watch," Trump said at the White House Monday. "Immigration is the fault, and all the problems that we’re having because we cannot get them to sign legislation, we cannot get them even to the negotiating table, and I say it’s very strongly the Democrats' fault." Trump has repeatedly negotiated with top Democrats on immigration since taking office in January 2017 — and even appeared to have the framework for a deal with Senate Minority Leader Chuck Schumer, D-N.Y., and House Minority Leader Nancy Pelosi, D-Calif., last summer — but his aides have more recently concentrated on collecting votes for his preferred approach to immigration control from just within the Republican Conference in the House. Nielsen said at a White House press briefing late Monday that until Congress takes action, "we will enforce every law we have on the books." Sen. Dianne Feinstein, D-Calif., has introduced legislation that would end family separations at the border. Rep. Mike Coffman, R-Colo., who is facing one of the toughest re-election battles in the country, said Monday that he would be willing to bring up a companion measure in the House. And Republican Sen. Ted Cruz, a Texan who is normally a loyal supporter of the president, said Monday he would introduce a bill that would create temporary facilities to keep families together while cases are being adjudicated and expedite consideration of asylum requests. But Sanders said Trump is focused on getting Congress to act on a more comprehensive plan that matches his immigration priorities, including the construction of a border wall and changes to laws affecting both legal and illegal immigration. "We want to fix the entire system," she said. "We don’t want to just tinker with it." Trump is expected to visit the Capitol Tuesday to talk with House Republicans about two bills they plan to vote on this week that would address family separations and the policies Trump has been pushing for since he came into office. Democrats have accused Trump of using children separated from their families as leverage to pass the rest of his immigration agenda. Nielsen said the kids were not being used as "pawns" in a political game. For weeks, Trump administration officials have defended the separation policy as a deterrent measure designed to prevent a spike in border crossings. Trump suggested as much in a tweet Monday, saying his policy was aimed at deterring criminals from bringing children into the country to shield themselves from detention and deportation. "Children are being used by some of the worst criminals on earth as a means to enter our country," he tweeted Monday morning. "It is the Democrats fault for being weak and ineffective with Boarder [sic] Security and Crime. Tell them to start thinking about the people devastated by Crime coming from illegal immigration. Change the laws!" But Nielsen and White House Press Secretary Sarah Sanders shied away from deterrence language Monday, arguing that the administration's hands are tied by existing law and court rulings. "The only [other] option is to not enforce the law at all," Nielsen said. Republican strategist Rick Wilson said Trump's rhetoric — calling the situation "sad" and faulting Democrats — suggests he doesn't like the way the politics of the controversy are playing for him. "I think what’s happening here is, the president is a little nervous about this," Wilson said. "He’s showing signs, at least in my view, that this is a moment of bad politics and bad optics and bad visuals, and the fact that he’s trying to blame Democrats for it is the reflexive Trumpian spin... I don’t think anyone’s really buying that." The political peril and allure of the policy were evident in a new poll from Quinnipiac University. Overall, only 27 percent of Americans surveyed supported Trump's approach. But 55 percent of Republicans backed it, compared to 35 percent who opposed it. More than nine in 10 Democrats and nearly seven in 10 independent voters were against the policy. An official at the Department of Health and Human Services told NBC News that there are 11,785 minors in its care as of Monday, a figure that includes "all minors at shelters and facilities in the unaccompanied alien children program." In just the last four days, 810 children have been taken in, and, at the current pace, the number of migrant kids being held by HHS would hit 20,695 by Aug. 1. Trump administration officials said that was not the outcome they want, even as they defended the policy. "We do not want to separate children from their parents. We do not want adults to bring children into this country unlawfully, placing them at risk," Sessions said Monday. "We do have a policy of prosecuting adults who flout our laws to come here illegally instead of waiting their turn or claiming asylum at any port of entry. … We cannot and will not encourage people to bring children by giving them blanket immunity from our laws." The solution, Trump and his lieutenants said, was for Congress to act on immigration legislation that changes the detention rules. After announcing he wouldn't sign the measure Friday, then pulling a 180-degree turnaround, Trump now backs a bill pushed by House Republican leaders that would address the detention issue while paving the way for construction of his border wall, limitations on the legal immigration system and protection for so-called Dreamers who were brought to the country illegally as children. "If you want to restore the rule of law, you must close the legal loopholes,” Nielsen said. "This get-out-of-jail-free card for families and groups who pose as families has spread — the word of this has spread — the smugglers and traffickers know these loopholes better than our members of Congress." While the Trump administration's "zero tolerance" detention policy has put pressure on lawmakers to act, it has also dominated the national political discussion in recent days, with many Republicans — whose party controls the White House, the Senate and the House — arguing that it must be changed. On Monday, Republican senators including Ben Sasse of Nebraska and Orrin Hatch of Utah added their names to a list of critics ranging from former first lady Laura Bush — who likened child detention centers to the U.S. internment camps of World War II — to evangelical Christian leader Franklin Graham. "Family separation is wicked," Sasse wrote on his Facebook page. "It is harmful to kids and absolutely should NOT be the default U.S. policy. Americans are better than this." Sasse also criticized the Obama administration's policy of releasing undocumented border-crossers pending immigration court proceedings, but said it didn't justify Trump's response. "This foolish catch-and-release policy had to be changed. But changing from catch-and-release does not require adopting the wicked family separation policy. The choice before the American people does not have to be 'wicked versus foolish.'" House Speaker Paul Ryan, R-Wis., said Monday morning on home-state radio station WISN that Senate Majority Leader Mitch McConnell, R-Ky., has led him to believe that the bill being pushed in the House can pass the Senate. There is no guarantee that House Republicans can pass their own bill: GOP leaders stopped gathering votes for it last week after Trump briefly came out against a plan that his own White House aides had negotiated with Republicans in Congress. There's also no guarantee that the proposal would make it through a Senate that has tried and failed to rewrite immigration laws for more than a decade. Schumer has slammed the legislation, which was written behind closed doors by GOP leaders and White House officials without input from Democrats. The bill was designed to pre-empt a bipartisan procedural maneuver in the House, known as a discharge petition, that would have forced the chamber to vote on a series of immigration plans, including one that would provide relief for participants in the Deferred Action for Childhood Arrivals program. "The House moderates will lose all credibility if they accept this sham of a bill, which is extreme and drastically cuts immigration in ways unacceptable to the Senate and the American people," Schumer said. "It holds Dreamers and kids who have been separated from their parents hostage in order to cut legal immigration and enact the hard right’s immigration agenda. If the House moderates really want to get something done on immigration, they should not be duped by their leadership for a bill that they know isn’t going anywhere."